You see that bridge? I’m going to walk across the pedestrian walkway on the lower level. Fool that I am. I guess when you think of New York City you might immediately think of cement because of all the sidewalks, but living here the first thing I think of is water. Four of the five boroughs that make up the city are islands, or on islands: Staten, Long (Brooklyn and Queens), and, Little, or as translated from the original owners’ name for it, Manhattan. And then there are the islands within the city – City Island, Coney Island (not really an island, but you know what I mean), Roosevelt Island, Governors Island, Liberty Island, Randalls and Wards Island, and depending on how you feel about New Jersey, Ellis. Not to mention Rikers. That is a lot of islands, all floating about on lots of water. But New York is not known as “The City of Islands” or “Metropolitan Islands” or whatever – I guess it doesn’t have to be, no need to attract more visitors. But with islands come bridges. By some counts there are over 2,000 bridges in New York. And that’s really what I want to talk about. Unless you’re ranting about increasing tolls or traffic, it’s easy to take all those bridges for granted. I never noticed our abundance of river crossings until a friend from Ireland kept taking pictures of them from the Circle Line. Living, as I do, on the mainland, (the Bronx) I cross bridges daily in order to keep my job (in Manhattan) and to come home again. Bus, subway, cab, commuter train; no matter the mode of transport, I’m crossing a bridge. And on the weekends I walk over a bridge. In fact, the neighborhood I live in has the word “river” in it, and the next nabe over has the work “bridge” in it. So there you have it. The weather today, October 25th, 2014, was beyond beautiful – the kind of nice weather that has people saying wherever they could find this year-round they’d move to. I meet up with my uncle on Saturdays for mass and lunch. He lives in the northern part of Manhattan and the walk takes about three quarters of an hour. 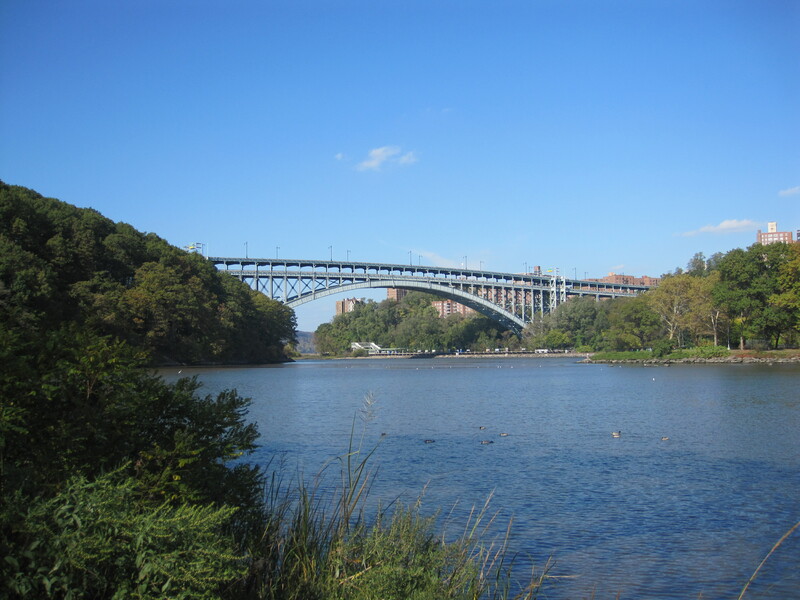 The bridge I cross is the Broadway Bridge that spans the Harlem River Ship Canal (or, to speak clearly, where the East River turns left and joins the Spuyten Duyvil Creek and then the Hudson River). This bridge has a pedestrian walkway, a few lanes of traffic in each direction, and the IRT Number 1 train, also in both directions. It’s about 1,300 feet long, approximately 24 feet above the water, and the sidewalk spills right onto it – you’re halfway across before you realize you’re even on a bridge, if you realize it at all. Like I was saying the weather today was perfect. During lunch I checked my phone and a story about hiking in New York popped up. I didn’t take the time to read it – just saw the headline and a few images, (much like when I’m cleaning out my DVR and only see what the Charlie Rose Show that I’m about to delete was about), but I got the message and made up my mind to take a different route home. To the west of the Broadway Bridge is the Henry Hudson Bridge; much grander, much longer, much higher, and much harder to get to, from the Manhattan side anyway. You just don’t find yourself on a sidewalk that has turned into a bridge. 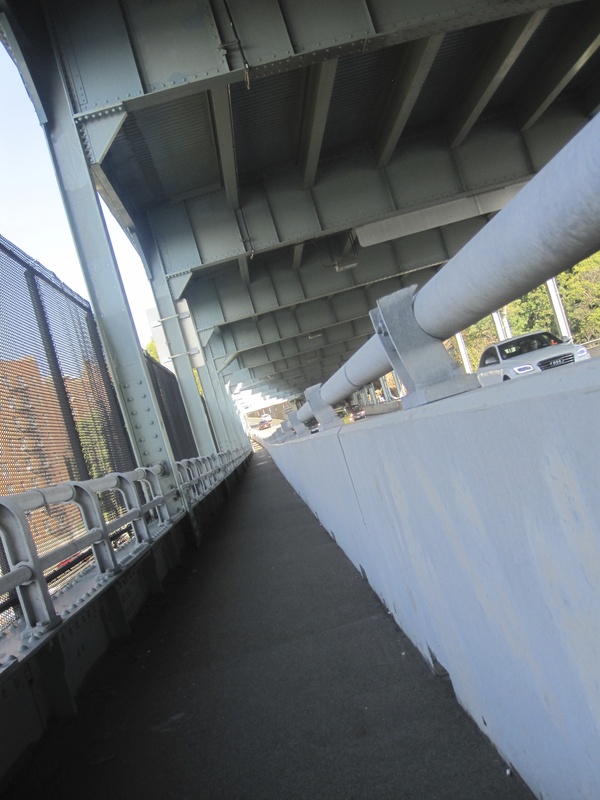 This is more of a road, the Henry Hudson Parkway, interrupted by a bridge. 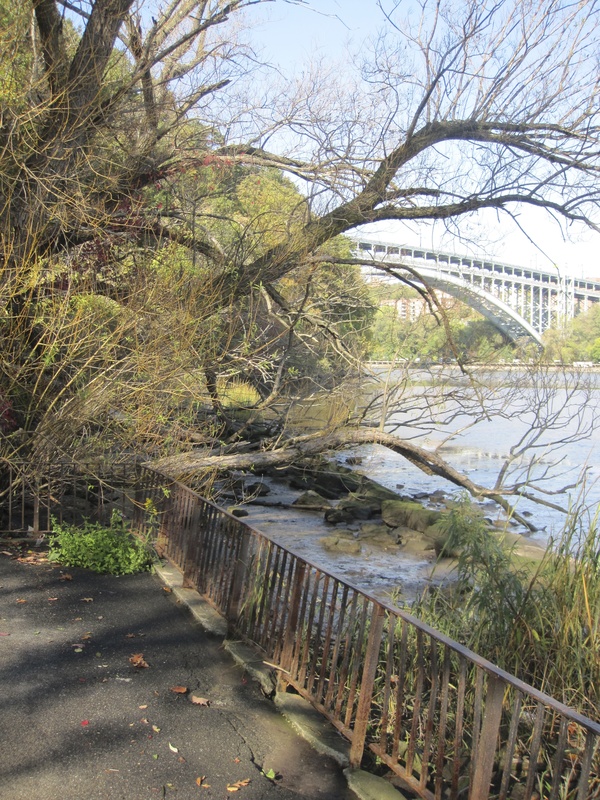 To access the pedestrian path from the south side you have to, literally, take a hike through Inwood Hill Park, until you are on the Hudson River side. The parkway is literally cut into the side of the hill. The Broadway Bridge as seen from the Circle Line. This is the view of the Henry Hudson Bridge from the relatively tame Broadway Bridge. Kids have jumped off that rock for years. A few weeks ago, arriving home from work at the Spuyten Duyvil Metro North station, I looked up at the Henry Hudson Bridge and spotted someone walking along the supporting arch – I’m sure he was doing some maintenance work or some such – but it put the thought in the back of my head that I’d never walked across that bridge, that I didn’t know how to access the bridge from the park, and also, that guy must be crazy to do that kind of work. But, if I ever found myself in the park and at the bridge I’d walk across it like a normal person. Why I looked up I’ll never know, but I give this guy a lot of credit. Well, I’m not unfamiliar with Inwood Hill Park. Aside from my uncle, other family members used to live in the neighborhood. As a child my father’s Aunt Kate would take us walking up through the trails exploring the caves and such. And I was not unfamiliar with the Henry Hudson Bridge or the Henry Hudson Parkway either, having traveled them my entire life. Every once in a while my mother would remind me that my first car ride was on that parkway and over that bridge when I was brought home from the hospital. Before car seats mind you. Oh, did I mention that Inwood Hill Park is sort of not the right name for the park? It should be called Inwood Mountain Park. Or, at least, possibly a better name for it would Very Big Rocky Hill Park. I know there ain’t no mountain high enough but when does a hill become a mountain? And though I hadn’t walked through it in years, I knew I could get to the other side and across the bridge. After saying goodbye to Uncle Pete I used my phone to see if there were any tips or informative posts that could guide me. I didn’t find much. A smattering of articles about cyclists bemoaning that they weren’t allowed to cycle across the span (something to do with width) and not much else. Well, what of it? Like Julie Andrews before me, and Mary Martin before her, I knew that the only way to get to the other side of any hill was to start at the very beginning. The end of the promenade before you have to turn and head into the woods. So off I went. I left the playing fields, the playgrounds, the marshlands, and the farmer’s market behind me and into the woods I traipsed. I didn’t tell anyone where I was going and I didn’t have a whistle, a bottle of water, protective rain-gear, or anything else that I would wonder that someone who got lost on a hill didn’t do or didn’t have. Rip, I’d like you to meet Van Winkle. I checked out an information sign hoping to find a marked path, but no luck. This sign’s job was to tell me about the preservation and sustainability of the reclaimed marshlands but I already knew that as the birds I saw floating around were not exactly pigeons. Not that I was worried. I’m Irish and although we will never be accused of giving good directions (“Get on that road there and keep going. If you pass the house that’s no longer standing you might be gone too far, so you’ll have to turn around and come back a bit until you hear the widow’s dog barking. But if she’s not out at the bingo, the dog won’t be barking, so come back a little bit more again…”), we certainly know how to navigate. Inwood Hill Park Forest Restoration signage. Great if you want to know all the technical stuff, not so great for directions. Which way do I go? You can never find a scarecrow when you need one, can you? My first test came a few steps in – the proverbial fork in the road. I knew there was a way to go under the bridge from low ground and climb back to it, and although one of the paths did go down, the other rose up, and as I had decided this would be a hike, up I went. I don’t know if forests are haunted or magical, or dark and creepy as the girl from Kansas put it, but they are different. It is amazing how one minute you are standing on a sidewalk listening to someone’s car radio and in the next you’re enveloped in, dare I say it, the sounds of silence? Also amazing is how familiar these forest sounds were. Did you know a babbling brook sounds exactly the same as when your neighbor upstairs overflows the bathtub into your apartment? I was not alone. When I saw my last dog walkers out in the open I did wonder if I would come across anyone else taking this same walk. I didn’t have to wonder for long. As the path inclined ever upward, I spied a family making the same cave explorations as our family did many years ago. A man, with the longest lens camera I’ve ever seen, and his father were walking down the trail. What is the protocol for a walk in the woods when you meet strangers? I know how to behave on a crowded subway or congested street corner, but alone in the woods? Wanting to be a good ambassador for New York I certainly didn’t want to snub anybody but what if they were enjoying a cloistered walk and didn’t want to be disturbed? I developed the ritual of not making eye contact but nodding my head (in case they were looking in my direction), hoping they would take this as a sign of silent courtesy. I think most people thought I was nodding off. Yes, this is Manhattan. Luckily the park provides trails and paths so I didn’t have to do any rope climbing. This was the path leading up to the top; if I fell and snapped an ankle would anyone hear me scream? Not that I passed many people, but enough to keep me nodding my head in greeting every once in a while. When I reached the top (not the highest point of Manhattan, that honor is held by 183rd Street and Fort Washington Avenue, two or three subway stops to the south) I paused to take a snapshot and let my calves rest. From another path I saw a young guy approaching. He found a rock, took off his jacket, sat on it and opened up his laptop. Really? I wanted to ask how the coverage was and what was he writing about and how noisy his roommates must be but I wasn’t exactly on a bus where it would have been perfectly normal to talk to strangers, so I kept my mouth shut. Thank you. And, special thanks to the search engines which weren’t able to tell me that. When the path splits, stay to the right. Got it. Because right is north and that’s where I was headed. See, the bridge is a double decker bridge – north side on top, south side on the lower, which is where the pedestrian walkway is. And if those directions don’t make sense to you, they made sense to me. And sure enough, down and under, and the path split and I stayed to the right. At some points I could see the cars, at all times I could now hear them, so no more worrying about where I was headed. The little path that would lead me under the parkway. This is the northbound traffic that I had to cross under. I’m heading home. Southbound traffic, carved into the hill. Finally off the trail I found some welcomed stairs. I live in a walkup, not on a mountain, so these I knew how to handle. I followed directions and went under the parkway in order to come back to the bridge. 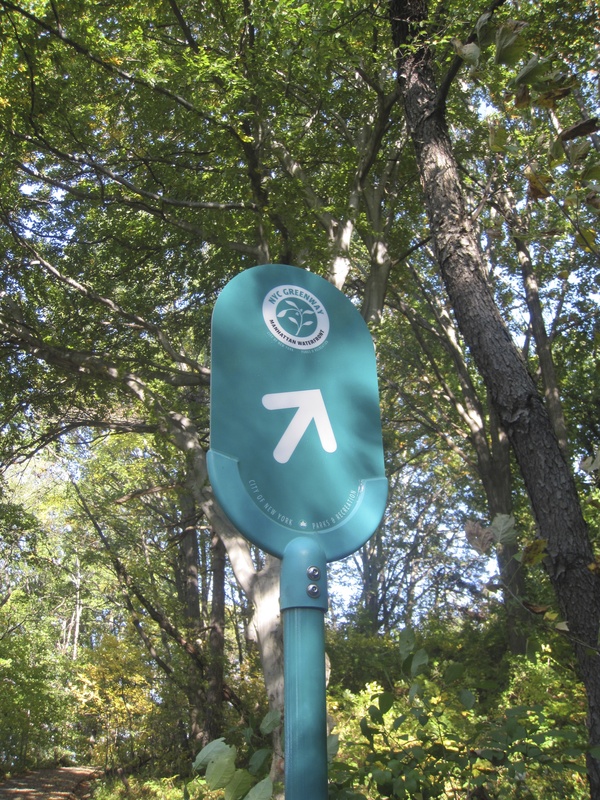 I eventually came across the only directional posting on my journey, a NYC Greenway sign that pointed to the right, and presumably the northbound parkway and access to the bridge. I put my destination on hold and continued down the path to see what I could see. I saw the Spuyten Duyvil bridge, the majestic Palisades, and far north up the river, probably some 25-30 miles away, was the Tappan Zee Bridge, all familiar landmarks to me. The views were lovely during the walk. A sailboat on the Hudson River. I wonder if they were looking at me or too busy enjoying the safety of being on the water and not up on a mountain. The views were lovely once you got there. Taking a turn down the hill closer to the Hudson River. This bridge is about 25-30 miles north of Inwood Hill Park, connecting Westchester to Rockland County. An old tv ad for the Dayliner Cruise Line used to refer to these outcroppings as ‘the majestic Palisades’ and it is no wonder why. Oh, the off the mountain on the river…I can dream. But I was descending off the hill away from the roadway and sensed I was not properly positioned. Two ladies were coming up, and as they were already chatting with each other, I didn’t feel I would be interrupting if I asked them if they had just come across the bridge. They hadn’t, they had come under it (as I would have if I’d take the lower path at the first fork when I started). So back to the Greenway sign and up again and there I was, at the toll plaza for the Henry Hudson Bridge and the last leg of my journey. This is the only sign I found on my trek. In the lower left hand corner you can see the last bit of the path that brings you up to the bridge, but I tuned left to get some views of the water. Did I tell you I’m afraid of falling? See, I’m not afraid of heights, per se, but I am afraid of falling. I do fine on planes, I volunteer to take visitors to the top of 30 Rock, and I’m sure I’d do fine if ever invited to a swanky cocktail party held in one of those $80 million dollar penthouses in the new towers currently under construction (“Nice, if you like streaky windows that you can’t clean.”) but put me on a cliff and I turn to applesauce. Once, out in California with my sister, I traveled southbound on Highway 1, sitting in the passenger seat, in a pure state of shock and terror. I have no business thinking I could walk across a bridge this high. At almost 150 feet down to the water, it is almost six times higher than the bridge I casually walk across weekly and if that doesn’t seem like much to you, than by all means, look down. I’m not sure if it was only 150 feet either. That translates, in building terms, to approximately the 15th floor and this seemed much higher. Maybe it seemed so because it is outdoors without any of the comforts of home or office, but still. But, what is life without challenges, right? I ride the subway at 4 a.m.; I can certainly walk across a bridge in broad daylight. And so I did. Just as I entered I spotted a sign prohibiting the taking of photographs or videos. Strictly enforced, no less. Well, I had wanted to snap some pictures but I was not about to be stopped in the middle of the bridge for an extended interrogation so I decided to follow the law. 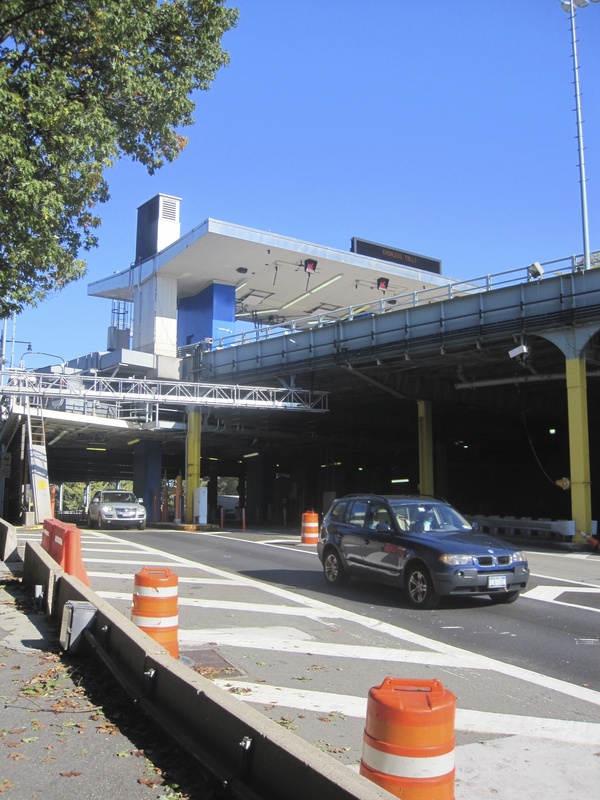 When you emerge from the forrest you are directly at the toll plaza on the Manhattan side. The walkway is on the west side of the bridge, the Hudson River side, protected by a fence, with the south bound traffic lanes to the east, or to the right. The distance from one end to the other seems so short when in a car. But not so short when on foot. I was relieved to see that the chain link fence was higher than I am tall. At 6’5’’ I always know how far away the ground is and it was some comfort to know that if I fainted to my left the fence would catch me before I fell into the river. With my right hand I grabbed hold of the railing and, as the saying goes, put one foot in front of the other. I was doing fine, sort of, but a few yards in you realize you’ve left the mountain and are now clearly over water, a long way down. And what I didn’t count on was the slight rise in the roadway – as high as you are when you start over the bridge, there is a slight uphill slant to the thing that you don’t notice while driving, but do notice if you have no desire to be any higher up than you were a moment ago. 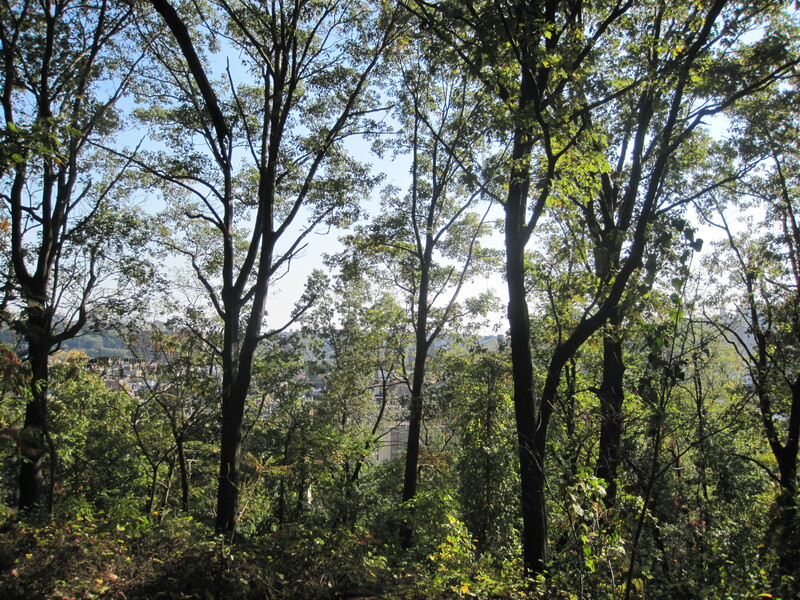 I dared not look out at the Hudson River or down at the Spuyten Duyvyl creek, so I turned my eyes toward the cars. Do people know what they look like when they’re driving? I wish those cameras that were enforcing me not to take pictures picked up some of the action I spotted. Some drivers were chatting away on their cell phones, some were eating and drinking, and others were conversing with their passengers. All this activity while they are driving over a bridge, a bridge above water? No photography or videography is allowed on the bridge. I’m about halfway across and have no idea how this ended up on my camera. I was not about to stop and take pictures anyway. So I focused on my goal – the other side. And soon a young mom was jogging toward me, pushing her child in a stroller in front of her. Well, that gave me hope. Surely if anyone knew that the bridge wasn’t going to collapse it must be she. In fact, she gave me so much hope that I snuck a picture. Arrest me. And then I saw it: land, dead ahead. Once over the rise it was easy sailing, or walking. But I guess I couldn’t call it walking because I was going at a fast clip. Not really skipping, certainly not jogging, but I was moving. Sort of like a dash to the men’s room or to the other side of the street when the light turns red unexpectedly. At the end of the narrow sidewalk are the steps leading off the bridge and back onto the mainland. The final steps off the bridge. This is the shout bound lower level, flanked to the left by the northbound upper level. No photos allowed on the bridge, but I turned back and snapped this. The sun was blinding so could not see the what I was snapping. The wilds of nature behind me, I’m back home in the Bronx. A statue of Henry Hudson overlooking his river and the crazy fools who walk across the Henry Hudson Bridge. On the Bronx side of the bridge you do step off onto a sidewalk that leads to short set of stairs leading down to street level. Another mom and her teenaged son had just come up the stairs, and were starting their walk south, the reverse of my trip. They were all smiles and I felt it was my duty to warn them. I don’t know what she thought I said, because her response did not match up. I had forgotten I was wearing a Yankee jacket. We all laughed and I wished them good health for their walk, and I was very happy to be out of the woods, off the bridge, and on a cement sidewalk where you can talk to strangers about anything. I can’t tell you how many miles I walked, how many calories I burned, what species of trees I saw, the names of the birds in those trees, the currents of the water below me, or any other fun facts that people are so interested in these days, but I can tell you that I did it. I found a bridge in the woods and I walked across it. And now that I know my way, I just might do it again. I made it into the woods and over the bridge and so happy to be back on a sidewalk. You just have to climb a few steps, not a mountain, to get on the bridge from the Bronx side.